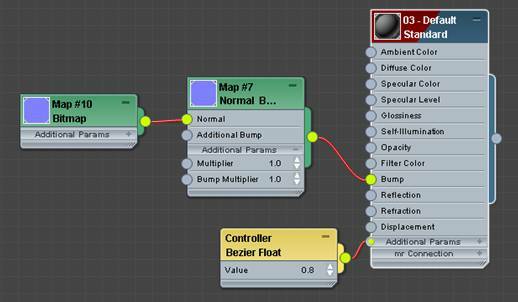 The purpose of a Normal Map, is to add extra 3D detail to a model without adding any more geometry to the model than is needed. 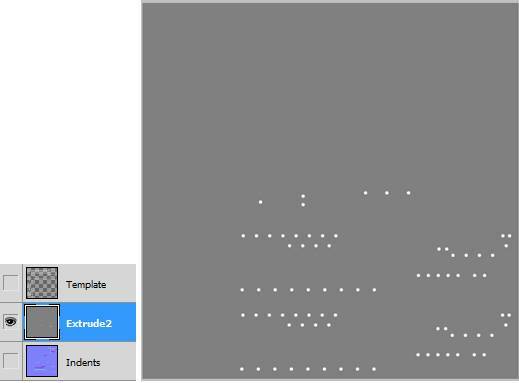 The darker the gray shade, the more of an Indent or pushed in effect will be generated on the model. 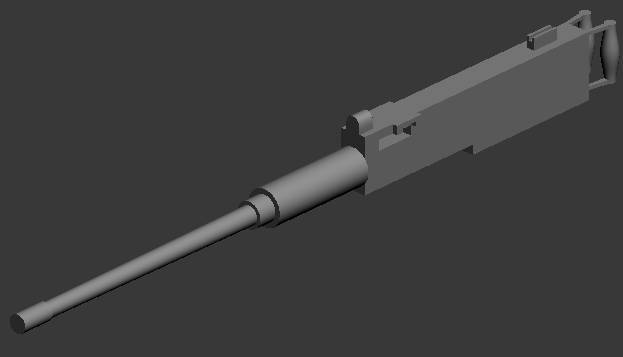 The lighter the gray shade, the more of an Extruded or pushed out effect will be generated on the model. 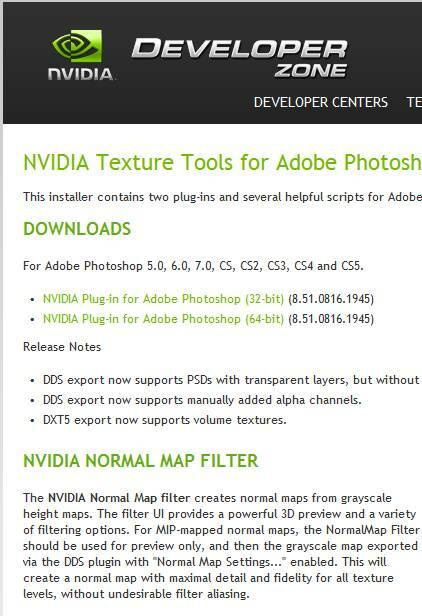 For Photoshop, the NVIDIA Normal Map Filter needs to be installed. You start your Normal map with a mid gray Base layer. In the layers above the base, the darker the gray shade, the more of an Indent(pushed in effect) will be generated on the model. 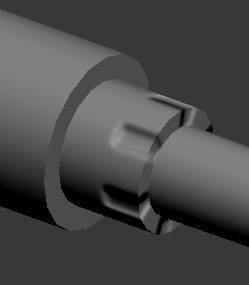 The lighter the gray shade, the more of a Extrusion(pushed out) will be generated on the model, like the rivets. 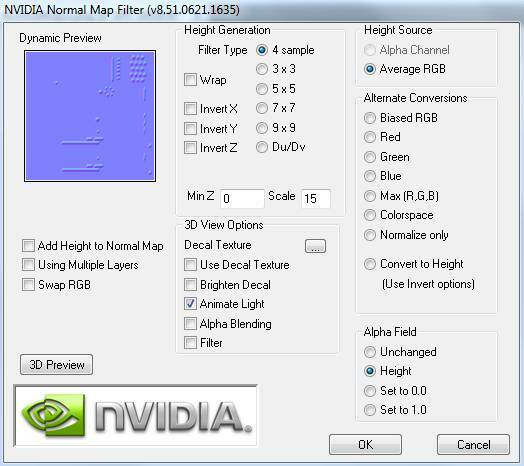 But first you have to use Normal Map filter to convert the above into a Normal Map below. Then apply the Normal map to the model. 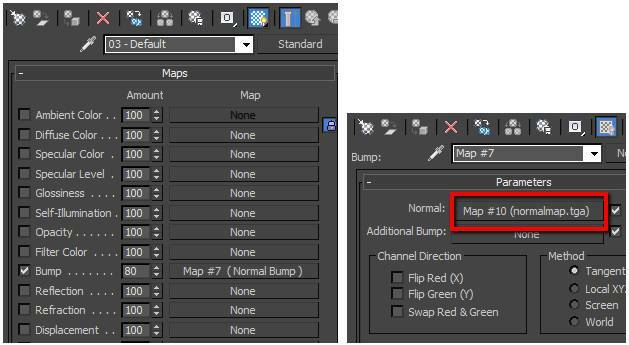 In 3ds Max, you can setup the Normal map with nodes if your version of 3ds Max has the Slate Material Editor. 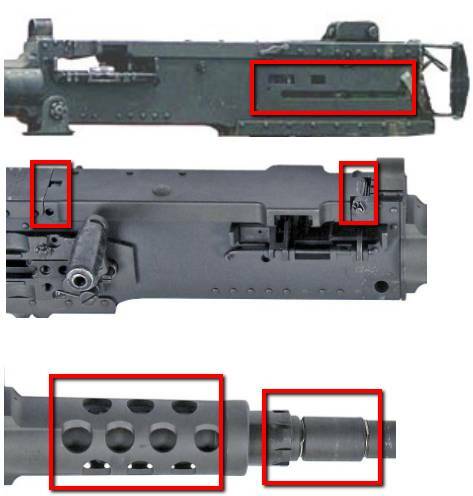 Open your final 50 Cal project file. Turn on the UV Editor. 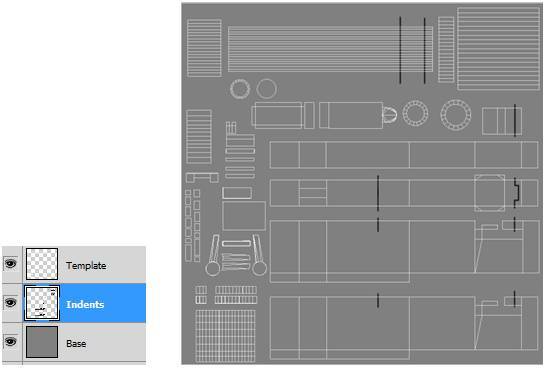 Use the parts layout as a reference when you are building your Normal map. 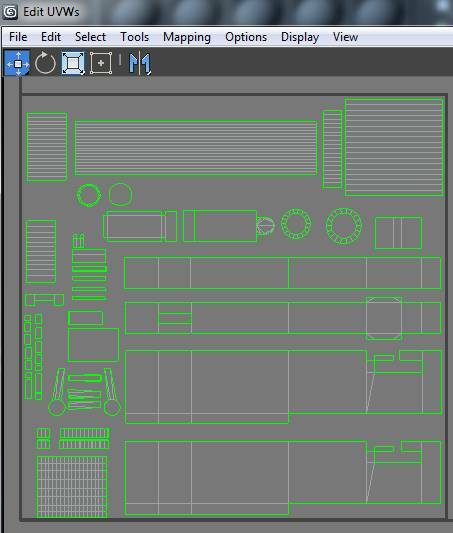 Open the UV template saved from the last tutorial, to start a new project. 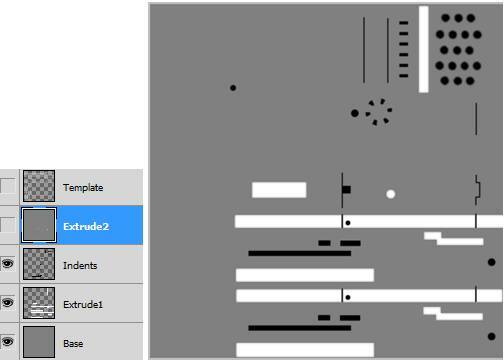 Add a new layer called Base and fill it with a mid gray, and move it to the bottom of the layer stack. Rename the top layer Template. Add a new layer Indents. Put it under the Template layer. In the red boxes are the indents to be created for the Normal Map. 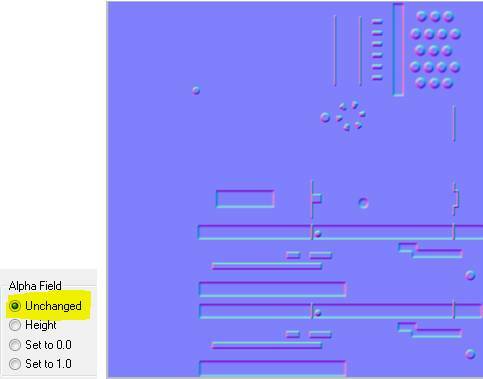 Then use the Rectangular and Elliptical tools to make selections for the highlighted indents shown below. Fill with black. 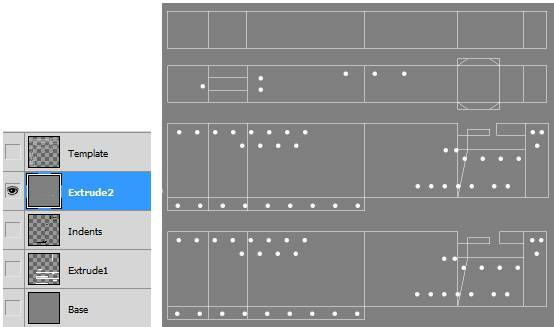 Use the Rectangular tool to make selections for the indents shown below or use a Pencil. Fill With black. This is for the second barrel segment. 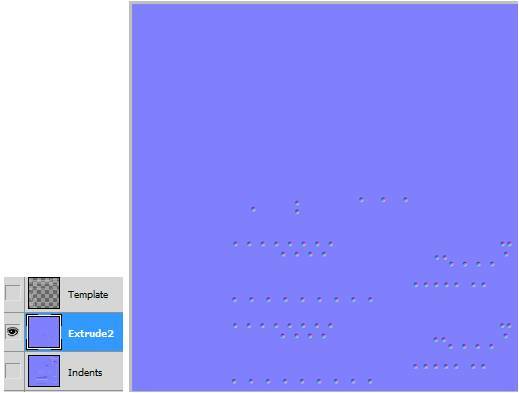 This is what the above marked areas in blue above will look like on the model below. 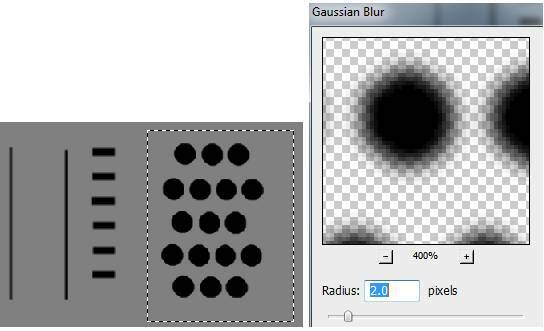 While on the Indents layer, go to Filter/Blur/Gaussian Blur at Radius 1 pixel. This will blur the edges of the indents created so far. 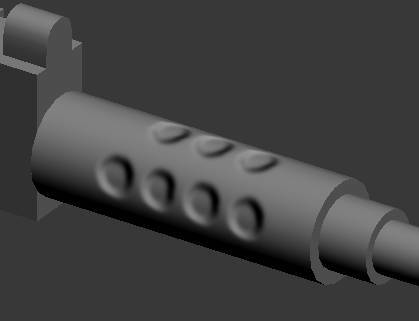 On the Indents layer, hold Shift while using the Elliptical tool to create circle selections for the first segment of the barrel as shown below. Use the Grid and Snap if you have to. Fill with black. 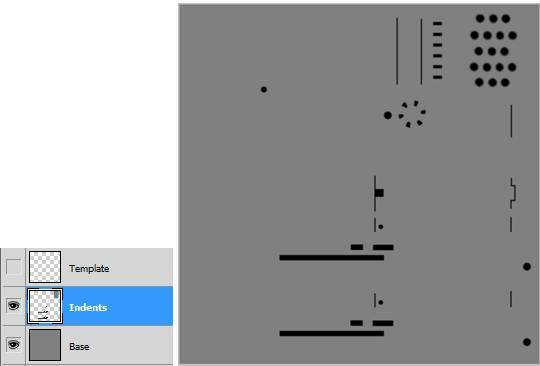 On the Indents layer, make a rectangular selection around the black spots. 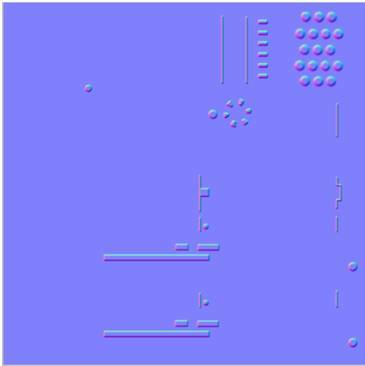 These holes are deep, so go to Filter/Blur/Gaussian Blur at Radius 2 pixels. 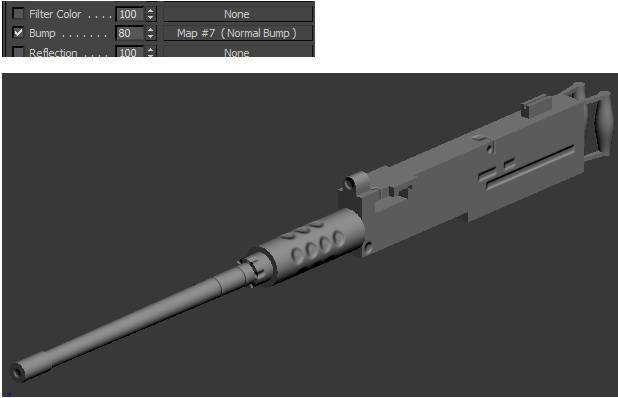 This is what the above Normal Map should look like on the model. 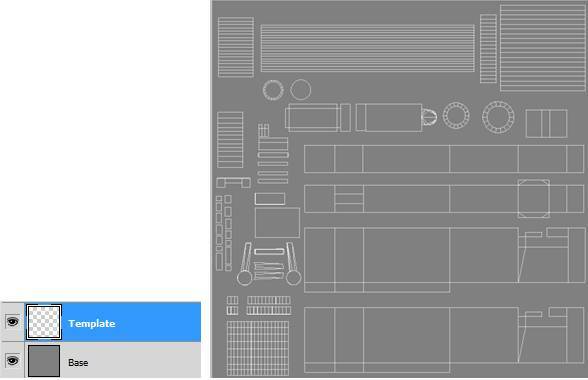 Turn off the Template layer, then flatten all layers. 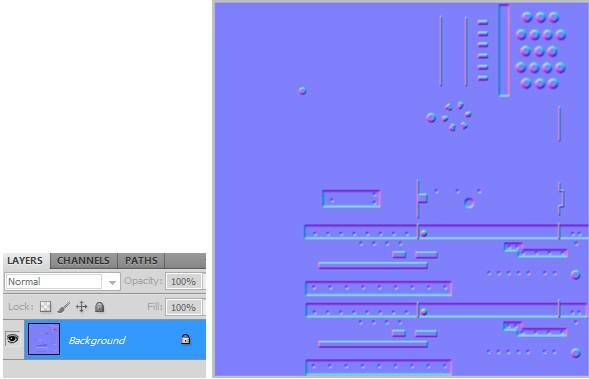 Click OK and you get a Normal map of the Indents. Go to Filter/Blur/Gaussian Blur at Radius 1 pixel to smooth the edges. Now go to Save As… and save it as a DDS,TGA or PNG file. Now test it in on your model in 3ds Max. Turn the Bump to 80%. In the red boxes are the Extruded areas for the Extrude1 layer for the Normal Map. 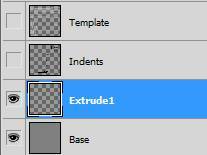 Create a new layer called Extrude1. Put it below the Indents layer to prevent overlapping the indents. 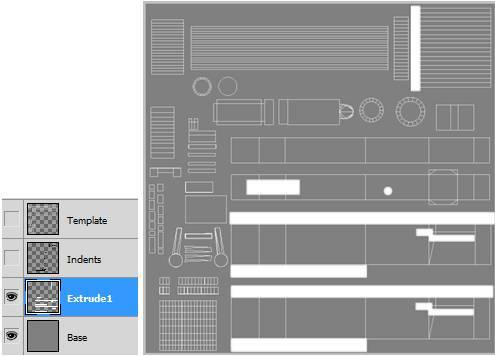 While on the Extrude1 layer, use the Rectangular and Elliptical selection tool to make selections for the Extruded areas shown below. Fill with white. 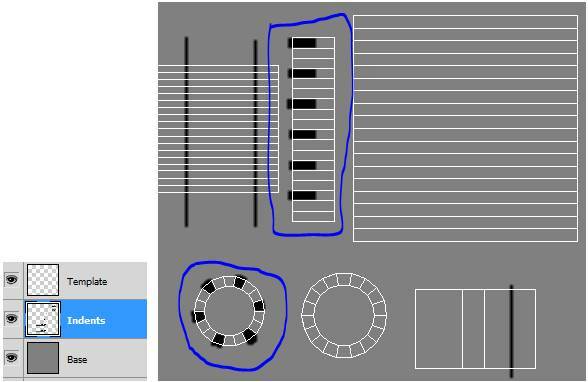 Use the Magic Wand tool to select the empty background, then go to Select/Inverse. Now go to Filter/Blur/Gaussian Blur at Radius 3 pixel. This will make a gradient on all the edges. When turned into a normal map, this will make these raised areas have rounded edges on the model. Turn off the Template layer, turn on the Indents layer, then flatten all layers. Open the Normal Map Filter. Click OK, and you get a Normal map of the Extruded and Indented areas. Go to Filter/Blur/Gaussian Blur at Radius 1 pixelto smooth the edges. 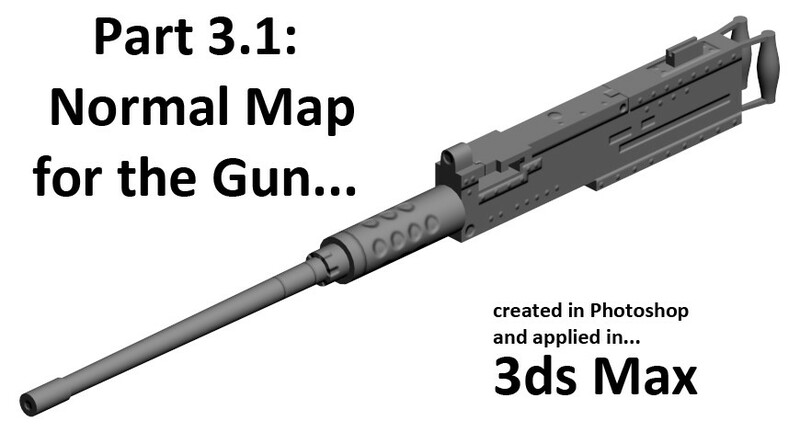 Now test it in on your model in 3ds Max. Create a new layer. Call it Extrude2. These will be for the rivets. 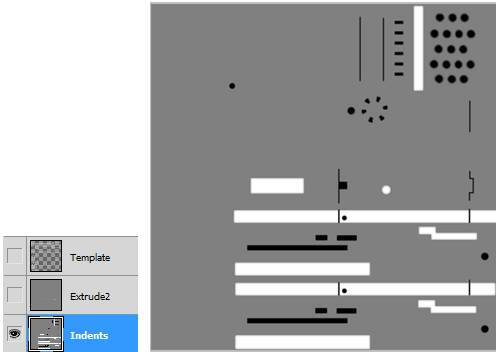 Place it under the Template layer. Fill with medium gray. In the red boxes are the Extruded areas(rivets) for the Extrude2 layer for the Normal Map. On the Extrude2 layer, use the Grid and snap with the Elliptical tool to create the rivet selections. Fill with White. You will have to zoom in and do this carefully. Make sure that Anti-alias is checked to smooth the edges. Turn off the Template and Extrude2 layers, and turn on the others. 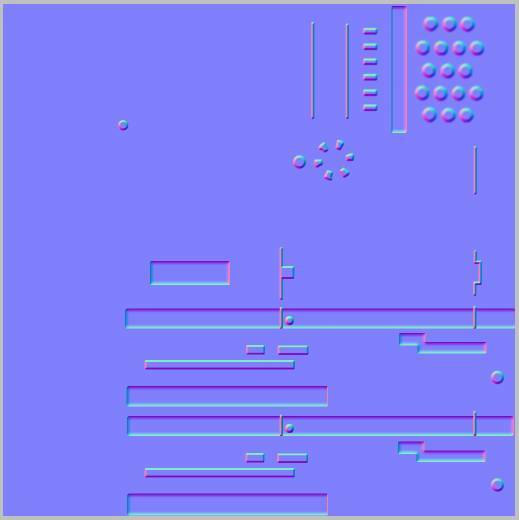 Then go to Layer/Merge Visible. All three layer merge into one. Open the Normal Map Filter. Change the Alpha Field to Unchanged. 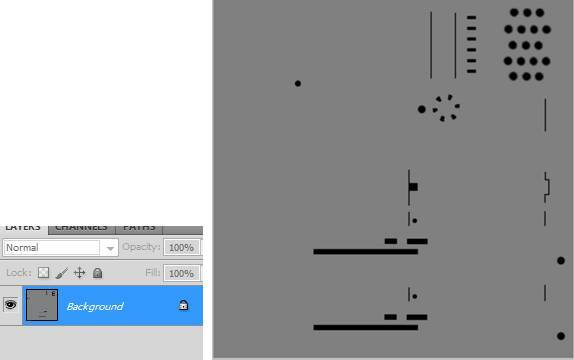 Click OK. Go to Filter/Blur/Gaussian Blur at Radius 1 pixelto smooth the edges. Go to the Extrude2 layer. Open the Normal Map Filter. 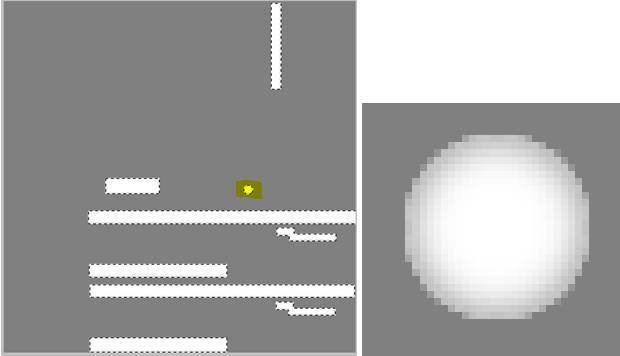 Click OK. Go to Filter/Blur/Gaussian Blur at Radius 1 pixel to smooth the edges. Change Extrude2 Layer to Overlay. Right Click over Extrude2 and uncheck the Blue channel. Check the results in 3ds Max. Back in Photoshop, CTRL+ALT+Z until you undo all the normal maps and get the four layers back. 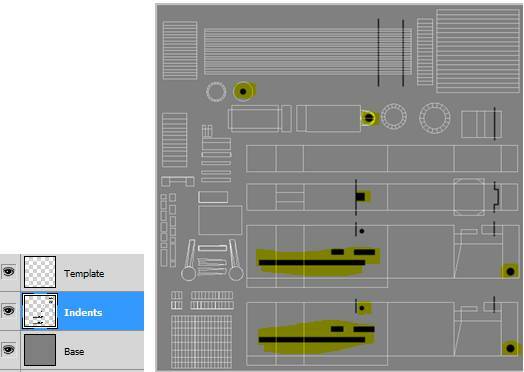 Then Ctrl-click all the layers below the Template layer, and right click and go to Link Layers. Under Layers on the menu, Group the layers and rename it Normal. 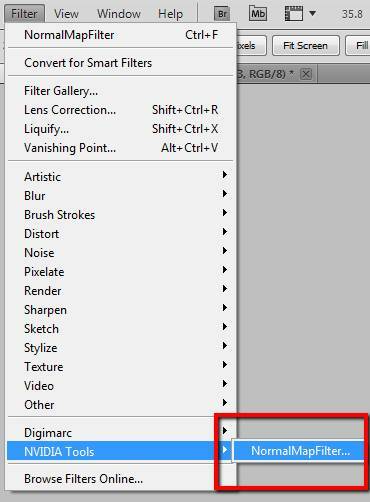 You may need to edit these layers again to create a new normal map if you make mistakes. 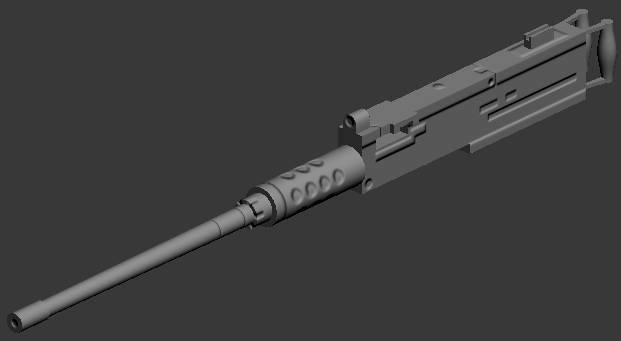 Not all the detail in the 50 Cal pictures are going to be used in this tutorial. 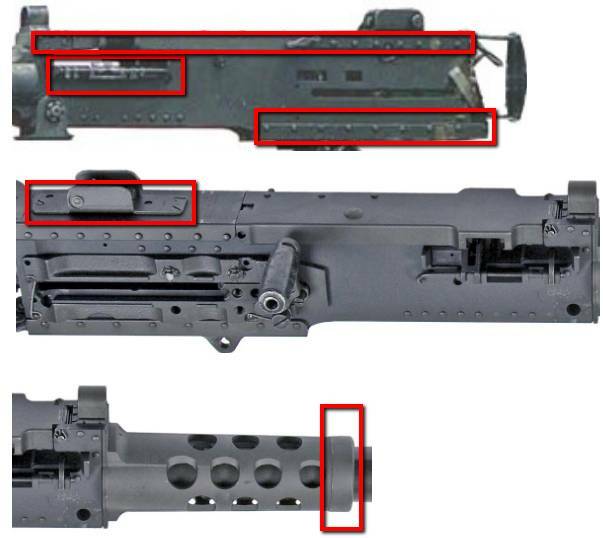 As you can see in the above model, we have plenty of detail to work with to make a realistic model. Next Tutorial, we will add a Diffuse Map to start building a color texture for our 50 Cal Gun.